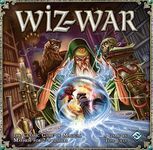 Description: Staying true to the spirit of the game that has entertained players for years, as well inspiring an entire genre of games, this 2011 edition of Wiz-War caters to the imagination and the funny bone. Casting an enriched array of spells, your wizards race through an underground maze, avoiding fireballs, werewolves, and psychic storms. Subtle game enhancements by Kevin Wilson and Tom Jolly promote faster play and clarify card effects.